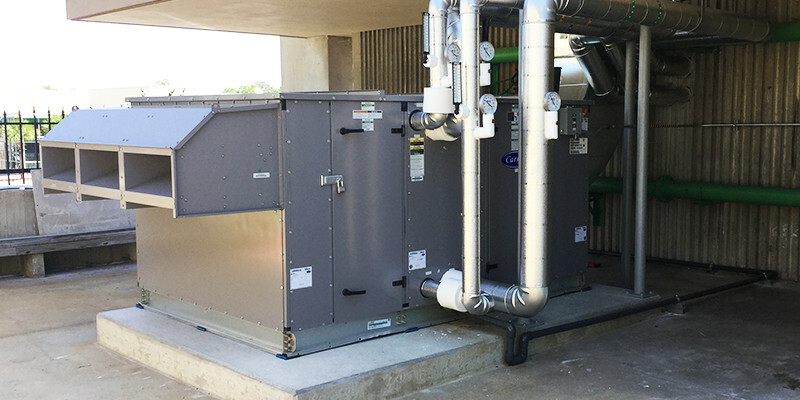 Projects | Gateway Contracting, Inc.
Summary: Furnished and installed six Electrochemical Calcium removal units to filter condenser water at two separate chiller facilities. Summary: Complete new plumbing installation for Bldg. 680. Summary: Converted existing water and waste water chlorine gas system to liquid sodium hypochlorite system to include installation of 3150 gallon poly processing storage tanks, all associated chemical piping, electrical service, and control wiring at Jacksonville’s Naval Station Mayport and NAS Jacksonville. Summary: Complete commercial plumbing installation for two three story administration buildings. Summary: Complete renovation of the men’s and women’s public restrooms within the hospital clinic including new tile, interior finishes, millwork, lighting, plumbing fixtures and trim. Summary: Installed two Natural Gas A.O. Smith Cyclone domestic hot water heaters with associated piping and venting. Summary: Install Natural Gas A.O. Smith Cyclone domestic hot water heaters with associated piping and venting in building 640 and building 11. Summary: Replacement of existing potable water mechanical hot water mixing valves with new electronic mixing stations by Armstrong to branch medical and dental clinics for Kings Bay, Key West, NAS Jacksonville, and NS Mayport. Summary: Replaced seven existing Air Handlers and associated piping, valves, and fittings. Summary: Furnished and installed twenty-one condensing boilers and two 150 HP steam boilers with associated pumps, gas, water and steam piping. Summary: Converted existing HVAC piping system from a two pipe to a four pipe system to include new heating hot water and chilled water piping, valves, fittings and pumps. Total replacement of the existing cast iron DWV system in the entire facility. Summary: Provided new plumbing installation, process piping, natural gas piping, compressed air piping, chemical process piping, HVAC installation and outside utilities for a 200,000 square foot concrete roof tile production plant in Sanderson, Florida. Summary: Furnished and installed two package air start systems for jet engine testing. Included electrical installation, system controls, compressed air piping and concrete foundation work at Naval Air Station Jacksonville. Summary: Installed a process line to remove protective wax coating for specific aircraft components. Included fabrication of stainless steel vats, steam coils, water recycle system, storage tanks, steam and steam condensate piping, controls and structural steel modifications at the Naval Air Station Jacksonville. Summary: Refurbish 2- Ransome Manufacturing water-bath LP gas vaporizers to include structural steel replacement, sheet metal jacketing and epoxy coatings. Replaced existing chiller with 150 ton Carrier chiller with associated piping, valves and fittings. Summary: Complete interior renovation of the east sector of Hangar 124 at NAS JAX. Renovations included demolition and reconstruction of interior walls, millwork, interior finishes, acoustical ceilings, flooring, and painting. Summary: Interior renovation of the galley cafeteria. Renovations included new flooring, painting, acoustical ceiling, millwork, countertops, plumbing and electrical. Summary: Altered existing layout of exam rooms. Alterations included the installation and re-location of interior walls, doors, acoustical ceiling, and cabinets. Re-location of HVAC duct work and electrical. Finishes included painting, installation of new FRP, and ceramic tile. Summary: Renovated existing interior space to create new command suite. Project included HVAC, controls, acoustical ceilings, interior walls, doors, floor covering. Summary: Replaced existing windows throughout eight stories of the main hospital building for Naval Air Station Jacksonville. Summary: Remodeled sector to create a “Clean Room” facility in Building 101U at Naval Air Station Jacksonville. Gateway Contracting was responsible for the complete renovation, purchase/installation of all equipment required for the Clean Room. Equipment included Environmental Chamber, vibration table, air shower, air compressor and dryer, high purity air system, and (80) work stations. Renovations included new tenant floor coating, construction of new clean room walls, ceiling and high purity ventilation system, installation of new FRP paneling, installation of new VAV boxes and associated duct work, HVAC controls and interior plumbing. Summary: Constructed concrete foundations with reinforced concrete slabs and concrete driveway ramps for new sprung shelters at Bldg.’s 346T and 811T. Summary: Work included Site Utility, Carpentry, Plumbing, Drywall Installation, Flooring, Glass, Door Installation, and Painting. Summary: Total office renovation to include interior finishes, cabinetry, doors, flooring, acoustical ceilings, painting, lighting, HVAC equipment and plumbing.